Smuttynose | Beer Apprentice - Craft Beer News, Reviews, Interviews and Info. Hello everyone. Thanks for checking back in on another craft beer review. 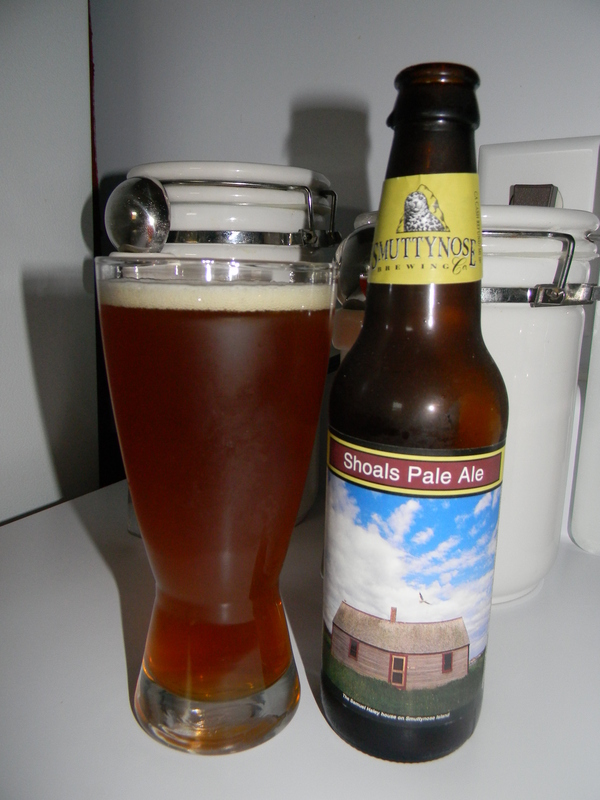 For today’s review I’m going to be trying the Smuttynose Shoals Pale Ale produced by the Smuttynose Brewing Company located in Portsmouth, New Hampshire. I’ve been in the mood for a solid Pale Ale lately and I sure hope this one satisfies my desire. Let’s get to the website, smuttynose.com, and see what they have to say about this brew. Our interpretation of a classic English beer style is copper-colored, medium-bodied and pleasantly hopped. Its flavor is delightfully complex: tangy fruit at the start, with an assertive hop crispness and a long malty palate that one well-known beer writer has compared to the flavor of freshly-baked bread. This beer came in a 12 oz. bottle and it had an ABV of 5.6%. It poured a hazy, caramel to amber color with some burnt orange highlights around the edges. The crown was off white, small, but smooth and slightly creamy. The retention time was solid and the lacing didn’t look too bad either. The nose released tones of caramel sweetness combined with some toasted grains. Earthy, floral hops intermingled with some hints of pear and apple. It had an almost yeasty/doughy kind of smell too. Well balanced and very nice. The taste let the malts shine. Sweet caramel and toffee coalesced with toasted breads, dough and grains. More of the fruity apple and pear goodness also. The earthiness stepped up as it began to warm, which aided even more in “rounding” off the flavor profile. The mouthfeel was medium bodied. Smooth, crisp, dry and semi-refreshing. The carbonation was of medium strength and a sturdy amount of flavor was left behind for me to enjoy between sips. Overall, I was most impressed with this beer. Super well balanced all around, not extremely complicated and very easy to drink. It totally hit the spot. It didn’t seem as hoppy as some of the other Pale Ale’s that are being produced today, but that’s ok with me. The malt forward profile was well suited and thoroughly enjoyed. I had no trouble at all in putting a couple of these down during my tasting experience that’s for sure. I’d highly recommend giving this classic a try if you have the opportunity. It’s one that shouldn’t be passed up. It’s, simply, a well made, proper, “old school” Pale Ale. What’s up guys? For today’s craft beer review I’m going to be trying the Smuttynose Robust Porter produced by the Smuttynose Brewing Company located in Portsmouth, New Hampshire. We have just recently started to get Smuttynose in our area, so this will be my first experience with one of their products. How ’bout we check on the website, smuttynose.com, and see what we have to look forward to by way of the commercial description? This hearty, mahogany colored ale is brewed to evoke the dark, full-bodied ales that were a favorite of dockworkers and warehousemen (hence the name “Porter”) in 19th century London. It is a good bet that when Dickens’ Mr. Pickwick sat down for a pint, we would have been drinking an ale much like our Robust Porter.This is a smooth and very drinkable beer, characterized by its well-balanced malt and hops, plus subtle notes of coffee and chocolate. Sounds good enough to me. Let’s drink. This beer boasted an ABV of 5.7% and it came in a 12 oz. bottle. It poured a deep brown color with some ruby highlights caressing the curves of the nonic glass. The tan crown looked very nice. It was smooth, creamy and sized well. The retention time was excellent and the lacing was sticky and clingy. A very nice looking beer I thought. The bouquet revealed nice, medium strength coffee and chocolate notes. Very well balanced between the two. Hints of toasted malts along with some toasted grains and breads. Sturdy, earthy, round hops added a bit more complexity, however the comprehensive fragrance imparted nothing out of the ordinary. Simply, a well balanced, correct and nice smelling Porter. The flavor was more of the same. Well blended savors of chocolate and coffee bean. It wasn’t extremely bitter though. Mostly complimentary. Just about right for a Porter if you ask me. More roasted malts, toasted breads and earthy hops were exposed as it warmed. Solid. The mouthfeel was medium bodied. Smooth, dry, slick, slightly chalky and just a touch chewy. The carbonation seemed to be of medium strength and more than enough flavor was left covering the palate after each swallow. Solid, solid, solid Porter in my opinion. Proper all the way around. It has enough character to illicit some discussion, yet it’s not going to overwhelm a craft beer drinker during a session. The drinkability was great. I have always enjoyed the Porter style and it’s been quite some time since I last had one. This was a great brew in which to be reintroduced. Porters were some of the first craft beers that I ever started experimenting with, so I will always have a soft spot for them and I would see no reason why I wouldn’t want to pick up the Smuttynose Robust Porter again next Fall or Winter. It was very satisfying. Have you guys ever tried this beer? What was your opinion? Feel free to leave a comment if you wish.